The keto diet (ketogenic diet) is a high-fat, low-carb diet that has a lot of benefits. More than 20 different studies have shown that this kind of dieting can help you to improve your health as well as losing weight. A keto diet can also be beneficial for people that have cancer, diabetes, Alzheimer’s and epilepsy. Let’s dive into it! Here is a detailed beginner’s guide to the keto diet. The word ”keto” is derived from the fact that this type of diet boosts the production of molecules that we call ketones. Ketones simply put are alternative fuel that our bodies use when there is not enough glucose to use.Our body produces ketones only if we consume a small number of carbs (that are quickly converted into energy) and if we consume a certain amount of proteins (not too much, if we eat too much it can be turned into blood sugar as well). The liver uses fat to create ketones. These molecules are used as an energy source in the body, and particularly in the brain. The brain requires a lot of fuel to run properly, and it can not use fat, but it can use glucose and ketones. When people are on a keto diet their bodies change their supply of fuel to fat, almost exclusively. Because of this, the body burns fat almost 24 hours a day! Also, when the level of insulin is very low, the body burns even more fat. The body goes directly to fat deposits for energy. Keto diet is great for people that are simply trying to shed extra fat, but a keto diet also has other benefits as well. One of them is a constant supply of energy and another one is feeling less hungry. Our bodies go into a metabolic state we called ketosis when they are producing ketones. The quickest way to getting to that state is not eating at all, but no one can last very long not eating at all. That is why a keto diet is very useful. You don’t have to die of hunger to reach ketosis. So you can lose weight without really fasting. As we mentioned it is a diet that is high-fat and low-carb. It is also similar to other diets that are low-carb and Atkins. Keto diet asks people to significantly reduce the consumption of carbohydrates and replace them with fats. This low-carb consumption makes the body to go into the state of ketosis. When this occurs the body becomes a furnace for fat and turning that fat into energy! Ketones are also produced by the liver, and ketones created in the liver are used by the brain. Being on a keto diet can lower insulin levels and blood sugar. This fact has many benefits for health on top of losing weight. Standard keto diet (SKD): It is high-fat and very low-carb. The consumption of protein is moderate. It commonly has 75% of fat, only 5% of carbs and 20% of protein. Cyclical keto diet (CKD): Here there are cyclical periods when the person has a higher carb consumption. For example five keto days and then two days with high carb consumption. Targeted keto diet (TKD): This one allows people to add more carb when they exercise. High-protein keto diet: It is very similar to SKD, but the difference is it allows for more protein. It commonly has 60% of fat, and 35% of protein and the carbs are the same, 5%. It is worth mentioning that only the High-protein and Standard keto diets were studied extensively. CKD and TKD are more complicated in their application and they are mostly used by athletes or bodybuilders. The information we are going to give you here is mostly about the Standard keto diet, and even though many principles apply. There are many different kinds of diets nowadays, but very often diets that are high-protein and low-carbs grab a lot of attention. The Atkins, South Beach, the Paleo diets are just some of the diets that fall right in that category. They are also called keto diets sometimes. But a real keto diet has one crucial difference. Unlike other diets that are low-carb, the focus is not on protein but it is fat! Fat in a keto diet gives you up to 90% of calories. And it is not the kind of diet that can do just to see whether it works. Ketogenic diets are used to lower the frequency of seizures in children that have epilepsy. Of course, it has been used for weight loss as well, but only short-term studies were conducted, and the findings of those studies are mixed. Kathy McManus is a dietitian, head of the Nutrition Department at Brigham (Harvard-affiliate) says: We can’t say whether it works in the long run, and we can’t say whether it is safe to use it long term. Who Should Definitely NOT try a Keto Diet? There are myths and controversies surrounding ketogenic diets, but for the majority of people, ketogenic diets appear to be quite safe. People that take meds for diabetes, like insulin. People that take meds for hypertension. These 3 groups of people should be extra careful, but it is always recommended to see a dietitian or a doctor before you choose which diet you are going to do! The aim of the keto diet is to push the body into changing the fuel source. So instead of using glucose (which comes from carbs like legumes, grains, fruits, and vegetables), the body starts using ketones. As we said already, ketones are produced in the liver and they are produced from fat! Fat burning seems like no brainer when it comes to weight loss. But actually achieving the state of ketosis is not so simple. You have to significantly reduce the intake of carbs, under 50 grams a day, and just for reference, an average banana contains around 27 grams of carbohydrates. To reach the metabolic state of ketosis usually takes a few days. If you consume too much protein, it can slow down or stop you from reaching ketosis. What can I Eat While on a Ketogenic Diet? We are going to give foods that you can eat and foods that you should avoid while on a ketogenic diet. Firstly, if you want to reach ketosis it is crucial to avoid carbs. You should probably consume less than 50 grams a day, and ideally, it should be under 20 grams a day of net carbs. The less you consume the better it is for achieving ketosis and losing weight and even fighting type two diabetes. Counting your carbs is often annoying, and if you follow our lists for recommended and not recommended you will able to reach ketosis without counting carbs. High-carb foods should be limited or avoided completely. Sugary foods: Fruit juice, soda, ice cream, smoothies, candy, cake, etc. Grains and starches: Foods that are wheat-based, pasta, rice, cereal, etc. Fruit: All kinds of fruit, except small amounts of berries, e.g. strawberries. Beans and legumes: Kidney beans, peas, chickpeas, lentils, etc. Tubers and Root vegetables: Sweet potatoes, potatoes, parsnips, carrots, etc. Low-fat and diet products: These foods are often highly processed and they often contain high amounts of carbs. Some condiments and sauces: They often have unhealthy fat and sugar. Unhealthy fats: You should reduce the consumption of mayonnaise, processed veggie oils, etc. Alcohol: Because of the number of carbs, a lot of alcoholic drinks stop the ketosis. Sugar-free foods: These foods very often contain a lot of sugar alcohols, and they can sometimes affect the level of ketones. They are very often highly processed. You should try to incorporate these foods into as many meals as possible. Meat: Steak, red meat. ham, bacon, sausage, turkey and, chicken. Fatty fish: Fish like salmon, trout, mackerel, and tuna. Eggs: The best are pastured eggs and whole eggs that contain omega-3. Cream and butter: You should try to find grass-fed whenever it is possible. Cheese: Look for unprocessed cheese (goat, cheddar, blue, cream, or mozzarella). Seeds and nuts: Walnuts, almonds, pumpkin seeds, flax seeds, chia seeds, etc. Healthy oils: Firstly extra virgin oils like olive oil, and coconut oil. Avocados: You should eat whole avocados and just made guacamole. Low-carb veggies: Almost all green veggies, onions, tomatoes, peppers, etc. Condiments: Salt and pepper are fine and you can use different herbs and healthy spices. You should try to base your keto diet almost exclusively on single-ingredient and whole foods. Luckily it is not so difficult to get a keto-friendly meal in a restaurant. In most of the restaurants, you can get some fish-based or meat-based meal. Order that and swap high-carb food why some vegetables. Meals that are egg-based are an option as well (eggs and bacon, omelet). You can also have a burger minus the buns. And you can swap the french fries with veggies. You can also add cheese, avocado, eggs or bacon. If you like Mexican, you can have any kind of meat and you can add guacamole, cheese, sour cream, and salsa. If you want a dessert, you can have berries with some cream, or a mixed cheese dish. In short: when you eat out choose meat or fish or an egg-based meal. Get extra vegetables to replace the carbs and starches. And get some tasty cheese for dessert. The benefits it brings are very similar to the benefits of some other diets that are low-carb as well. With the distinction of keto diets seem to be more powerful. Keto diet is just like your average low-carb diet but on steroids. It maximizes the benefits for people that follow a ketogenic diet. But it can be more difficult to do in practice, and it might even increase the chances of side effects showing up. With a ketogenic diet, your body will turn into a furnace that burns fat! The rate at which your body burns fat will increase dramatically and at the same time levels of the hormone that is responsible for fat storing (insulin) will go down. It simply makes it easier to lose extra fat and it even helps with easing the feeling of hunger. Upwards of 30 scientific studies were done about keto dieting and they have shown that keto diets are more efficient than some other low-carb diets. While on a ketogenic diet you will most likely gain a newfound control of your appetite. When the body is burning fat 24 hours a day, it taps into the deposits of fat for weeks or months (depending on how long you stay on the diet). That lowers the feeling of hunger drastically. It is quite common for people on a ketogenic diet, and it is proven by the studies. This allows people to have better control over how much and what they eat, which just further improves your chances of achieving your goal! Intermittent fasting becomes easier on a ketogenic diet as well. That can improve your chances of completely reversing type two diabetes and make weight loss even quicker, way beyond the results of the keto diet only. You can also save a buck here and there because you won’t have to have snacks as much. Often people skip breakfast and eat only twice in a day and some even eat only one meal. Because you will not have to battle with cravings and the feeling of constant hunger, it can help people that have a food or sugar addiction, and in some cases, it can help with eating disorders, e.g. bulimia. Feeling satisfied is a big part of the solution. Food no longer have to be the enemy and it can become a friend or just fuel, but being satisfied with your results and eventually with yourself is a crucial part of success. Step by step! People that are on a keto diet can control the level of sugar more easily. It is great for people that have type two diabetes, and in some cases, the illness can be completely reversed. This is a fact proven by those 30+ studies. It makes sense because a ketogenic diet reduces the levels of blood sugar, and it reduces the need for constant meds and because you use fewer meds you reduce the risk of high insulin side effects. Because a ketogenic diet can in some cases completely reverse the illness, it is safe to say that it is a good way of preventing it in the first place. Studies have shown that low-carb diets often improve the condition of several risk factors that can lead to heart disease, like cholesterol profile (triglycerides and HDL). Complete LDL and cholesterol levels also get improved but only slightly. It is very common to see healthier levels of blood sugar, and blood pressure. These health markers get improved often for people that are on a keto diet. The markers are connected to the ”metabolic syndrome”, improvements in waist circumference, weight, reversing type two diabetes, etc. Some people are on a keto diet exactly because of the improved mental agility. It is also quite common that people feel more energetic while they are in ketosis. The brain does not require dietary carbs while you are on keto. It gets its energy from ketones 24 hours a day, and ketones are quite effective as brain fuel. So, ketosis gives the brain a constant flow of ketones as fuel, which prevents problems with big changes in blood sugar levels. Some people will experience an increased ability to focus and concentrate, there will be able to get rid of the brain fog and their thinking will be crystally clear. A ketogenic diet can give some people a calm stomach. This means fewer cramps, gas, and pain. Often it helps people that have IBS. For some people, this is the sole reason they choose to do it, and it usually takes about two days to notice the difference from before you started your diet. Keto diets can result in improving your endurance simply because your body now has better access to the deposits of extra fat, which it starts to use 24 hours a day once you reach ketosis. The supply of carbohydrates that the body has stored lasts only a few hours of exercise, for some people even less. But the deposits of fat have enough energy to last for weeks! Beyond ketosis, there is another potential benefit of keto diets, the improvement of BMI and a lower percentage of body fat! Lowering the percentage of body fat can be valuable not just for people that want to lose weight but also for athletes in competitive sports. Keto diets are proven that they are an effective treatment for epilepsy. It has been in use since the ’20s of the last century. Usually, it was for children that have epilepsy, but in recent years many adults have seen the benefits of keto dieting as well. People that are on a keto diet can take fewer drugs and in some cases no drugs at all. This means that just being on a keto diet can significantly reduce the chances of an epileptic seizure. Taking fewer drugs leads to a lower risk of any side effects for people with epilepsy. The benefits which we listed thus far are common. There are some other benefits that might not be so common but they might be life-changing for some. A ketogenic diet can help people that have hypertension. People that have problems with acne can get rid of them. People that have often migraines can reduce the frequency or the severity. It can also help people with certain mental health problems! Keto diets are very effective and they are quite safe. They are used to treat people with epilepsy and the ketogenic diets help them to reduce or completely remove the chances of a seizure. How to Achieve Ketosis While on a Ketogenic Diet? Here is a list of 7 things that are crucial in order to achieve the state of ketosis. We ranked them for the most important to the least. Restriction of carbs to under 20 grams a day. This is a strict keto or low-carb-diet. You do not have to restrict the consumption of fiber though it can be good for ketosis. You might ask yourself how much exactly is 20 grams. We mentioned before that an average banana has around 27 grams of carbs. So, a ketogenic diet requires planning for specific meals and recipes. Very often simply the restriction of carbohydrates to extremely low levels can lead to ketosis. So for some people, this might be all that they have to do. But other people will need the entire list to ensure success! Protein consumption should be moderate. On a keto diet, one should eat protein that the body needs, but no more than that. The body turns all excess protein into glucose which makes ketosis less effective. Ideally, you should try to be at 1.5 grams per kilogram of weight a day. So, if a person is 70 kilograms, that person should consume around 100 grams a day. A mistake that people often make is consuming protein too much. The ketogenic recipes that we offer are created so that they have just enough protein. And that is the problem walking that fine line that does not impede the process of ketosis. Consume enough fat, enough to feel full. This is a great difference between starvation and ketogenic diets. Even though they both eventually lead to ketosis, a keto diet can be sustained, starvation can not! This is the big difference between a keto diet and starvation, that also results in ketosis. A keto diet is sustainable, but starvation is not. While fasting you will probably feel tired, hungry, cranky, etc. But on a keto diet, you will not be any of those things and that is why it is sustainable. So eat until you are satisfied, and if you have problems with hunger, then add fat to your meals like extra butter or olive oil. Our recipes have the kinds of fat that you can consume. Avoid snacks when you are not feeling hungry. Eating when you are not hungry, just because there is some food around can reduce the effectiveness of ketosis. If you use ketogenic snacks the damage will be minimized, and snacks are perfectly fine when you do feel hungry! Intermittent fasting should be added if necessary. You can skip your breakfast and have all your meals in the range of 8 hours a day and fast for the rest 16 hours. This is an effective way of boosting the levels of ketones, and it also speeds up weight loss. It is also good for people that have type two diabetes. It is not so hard to do it on a ketogenic diet. Add exercise. Any physical activity can be beneficial especial if you are on a low-carb diet. It can even slightly increase the level of ketones. Exercise can accelerate weight loss and it is good for people whit type two diabetes. It is not a must do in order to reach ketosis, but it can help! Enough sleep is always important. Usually, 7 hours of sleep is enough. Also, stress can have an adverse effect on ketosis so if possible try to avoid it. Lack of sleep and high levels of stress hormones raise the level of blood sugar, that slows the process of ketosis slightly. Stress can make it harder to stick to the plan and fighting off temptations. So taking care of your stress and sleep will not lead you to ketosis, but if you do not they might slow down your progress. To summarize briefly, in order to achieve ketosis you will have to restrict the consumption of carbs, if possible to under 20 grams of carbs a day. That is the most important factor out of these seven if you want to reach ketosis. If you want a greater effect of ketosis, just follow the rest of the list to the end! How to be Sure That I am in Ketosis? After you begin your keto diet it is possible to test your urine, breath or blood to be 100% certain whether you are or you are not in ketosis. There are some symptoms as well that can tell you without any testing. Increased urination. It might be only because your body wants more water. But at the start of the diet, you also might have to go to the toilet more frequently. Keto breath occurs. This happens because of acetone which is a ketone body. The breath of a person on a keto diet can get a fruity smell or a smell that is similar to polish remover. The smell can be noticed from sweat while working out. Often times it is not permanent. These can also tell you that you achieved ketosis. Reduced hunger. Many people have a reduced feeling of hunger once they start their diet. This is probably because the body switches to an alternative source for energy. Many people eat just once or twice a day while on a keto diet and by doing that they also end up doing accidental intermittent fasting. This can be very beneficial for accelerated weight loss. Possibly increased energy. After the ''keto flu'' passes a lot of people feel an increase of energy. This can manifest in clearer thinking or even a mild euphoria. There are only three ways that you can determine whether you are in ketosis or not. They all have their advantages and disadvantages. Urine strips or urine testing. Breath analyzers that measure the ketone levels in your breath. Blood testing simply measures the levels of ketone in the blood. This is the cheapest and we think the simplest way of doing it. Many people choose this option because of it. Simply dip it in urine and after about 15 seconds you will see a color change that shows you is there a presence of ketones. If it turns to dark purple that means you have reached ketosis. Breath analyzers are simple to use. But they are pricier than urine strips. They are cheaper than ketone blood meters because they are reusable, and after some time it adds up. They do not provide an exact level of ketones, they will show you a color code that shows a level of ketones, but not an exact measurement. Blood meters will show you an exact number that measures the level of ketones in the blood. They are the most exact way of measuring ketone levels. They are not so cheap especially if you count in continual use, for checking your level of ketones in the body. Starting a keto diet and reaching ketosis is not such an easy thing. And it is not simple as I am in ketosis or I am not. There are different levels of ketosis. The higher the level of ketones in the blood the higher the level of ketosis. Under 0.5 mmol per liter means that a person is not in ketosis. And a level of, 0.2 shows that one is getting close. On this level, one is still far from the optimal fat-burning ketosis. Between 0.5 and 1.5 mmol per liter is a baby nutritional ketosis. This will most likely give you positive results. From 1.5 to 3 mmol per liter is considered to be optimal ketosis! It is recommended for optimal physical and mental performance gains. It maximizes fat burning. Over 3 mmol per liter is more than it is necessary. Most likely it will not give you any better results than the ''optimal ketosis''. It can also indicate that you are not eating enough (''starvation ketosis''). For some people that have type 1 diabetes, it might mean that there is a lack of insulin which requires urgent reaction! Over 8 to 10 mmol per liter is usually not possible to achieve just by following a ketogenic diet. It means that something went wrong. The most common thing is type one diabetes. It shows a severe deficiency of insulin. Symptoms of this are vomiting, nausea, confusion and abdominal pain. If not treated correctly it can result in ketoacidosis. In some cases, it can be deadly and it requires immediate care. A ketogenic diet can be quite simple, but it does help to learn some new skills. Learn how to make simple but enjoyable meals. If you have avoided fat before and you are not sure how to incorporate it now, then read up on it. If you want to go to a restaurant and still follow the rules of your diet, it is possible. These tips are going to give you an insight into your world on a keto diet and maybe even answer some questions that you have. A ketogenic diet, but on a budget? If you love eggs and bacon, great! If you are not a fan, there are some ketogenic breakfasts that have 0 eggs in them. People often say that breakfast is the most important meal of the day. Well, that might not be entirely true. On the other hand, if you are hungry in the morning and in a hurry, there are many keto recipes for breakfast that are easy to make, that will fill you up and finally are quite tasty! Daily planning can be very simple, but it has to be done it is very important for the whole operation! Lunches and dinners can be fish or meat or chicken with some vegetables or a salad with some cheese, melted butter or an high-fat sauce. We offer hundreds of recipes for tasty ketogenic meals. People usually think that keto is expensive. It sure can be. Good quality food is more expensive than food that is not of such quality. But there are different ways of following a ketogenic diet properly and making it cheap! People have feared fat for years. We all know that it tastes pretty good, it is also satiating and healthy. If you want to learn how to incorporate fats into your meals, and which fats, we can help you! We offer hundreds of recipes for different meals and we can show you how to use different fats in your everyday life! Here’s a general tip, if you are on a keto diet but you are always hungry, you should eat MORE fat! People love bread and sometimes it can be hard to get rid of it. But a ketogenic diet allows you to eat certain kinds of bread that are low-carb and can be eating without impeding your progress. Going to a restaurant or visiting your friends can potentially be a problem. But if you know your do’s and don’ts there will be no problems! Avoid eating starchy foods like pasta and bread. And you can ask them for more natural fat (olive oil, butter). Temptations can be hard to resist sometimes, everyone knows that. But to make it a bit easier we offer some foods that are tolerable, but only for a cheat day! A common mistake that people make is believing in marketing. Especially when it comes to foods that are branded as low-carb. Remember that an average banana has around 27 grams of carbs and you should try to be under 20! A good ketogenic diet has to have real food as its foundation! So avoid products that are marketed as low-carb like candy, chocolate, bread, and pasta. They are often branded as low-carb but in reality, they are simply junk food. We are going to give you the answers to some of the most commonly asked questions about keto dieting. 1. Can I eat carbs ever again? Simply put, yes. But it is crucial to drastically reduce the consumption of carbs at the beginning. After a couple of months you can have carbs from time to time, just remember to follow your keto diet in between those times. 2. Do I have to lose muscles? There is a possibility of losing muscle mass if you on a diet, and that means any diet. But high levels of ketones and high protein consumption will minimize the chances of that from happening. And this especially stands for people that lift. 3. Can I make muscles on a keto diet? It is possible but it will probably not work as good as on some diets that allow for more carbs. So it is possible but it is not optimal. 4. Do I have to refeed? No there is no need. But, a few days with higher intake of calorie could be beneficial. But a limited amount of days and definitely not often. 5. How much protein should I eat? Protein consumption should not be high because it can increase the levels of insulin and reduce the levels of ketones. It should be around moderate and the number is your limit is 35% of your calorie intake. You should not go over that number! 6. What should I do if I am always weak, tired, or fatigued? It is possible that you have not reached ketosis fully or that you are not using ketones and the fats efficiently. You should try to further reduce your consumption of carbs, and revisit the seven points that we mentioned. MCT oil might be helpful. 7. My urine has a fruity smell. Why? No need to worry about this. This happens because of by-product that is created during ketosis. It is common. 8. My breath smells bad. What should I do? This is a common occurrence. Drinking flavored water (natural) or you can try some sugar-free chewing gums. 9. I heard that ketosis is very dangerous. Is that true? Sometimes people mix up ketoacidosis with ketosis. Now, ketosis is not dangerous and it is normal. The latter is dangerous and it happens only to people that have diabetes and only if they are not careful. Ketoacidosis is very dangerous, but ketosis is not. Ketosis is natural, healthy and normal! 10. I have problems with digestion and diarrhea. What should I do? This is another common occurrence and it usually goes away after 3 or 4 weeks. If it doesn’t go away incorporate more high-fiber vegetables in your meals. Supplements of magnesium can be helpful constipation. 11. How many pounds am I going to lose on a ketogenic diet? This depends, and the results can be very different. On average people use 2 to 4 pounds (1 or 2 kilograms) in the first 7 days. This is mostly water weight. After that on average people lose around 1 pound (0.5 kilograms) of extra fat weekly. Now, some people lose weight at a much higher rate (usually young men), and some even slower (usually women that are over 40). If you follow the tips we talked about before you can accelerate the process of ketosis and by doing that the process of weight loss. When you get close to your optimal body weight, you will lose extra weight slower and slower as you get closer. But if you just continue following your keto diet and only eat when you feel hungry, eventually you will stabilize your body weight, The you can choose whether you want to stay on a keto diet or not! 12. How can I track my intake of carbs? If you follow our keto recipes and meal plans there will be no problems for you to remain under the required number (20 grams a day). You won’t have to keep track or count your carb intake. 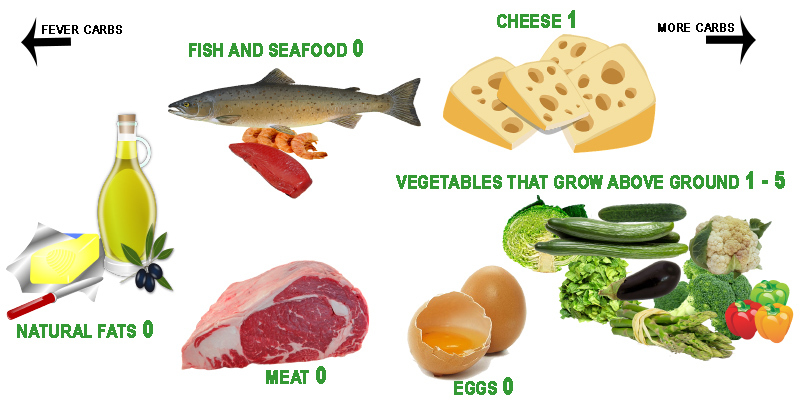 If you use our guidelines for keto foods and our visual guides, there will be no issues for you because you will always be under the number of 20 grams a day! Now if you want an exact number you can use some app for your phones like Chronometer or MyFitnessPal. 13. What should I do after I achieve my weight and health goals with a keto diet? Once you accomplish what you set out to do, you can choose between continuing with a keto diet (to keep the ketosis) or you change it and add more carbs. If you decide to add more carbs two things can happen. First, the ketosis will be less efficient and second, you can put on some weight back on. But that depends on how much carbs you add to your diet. If you are able to control yourself then you shouldn’t put back on any weight. But if you completely go back to your old eating habits, you will start putting back on the weight, little by little. Like exercise, once you stop exercising the benefits start fading away. So even if you achieve your goals completely you will have to take care of yourself and be mindful of what you eat! When your metabolism switches from burning glucose (carbs) to using ketones and fat for energy there might be some side-effects in the transition period until your body gets acclimated to the new fuel. This especially stands for the period between day 2 and day 5. Symptoms can be tiredness, headache. cramping, muscle fatigue, and heart palpitations. Thes are not permanent side-effects and usually, they go away quickly. And there some ways that you can minimize the chances of them bothering you! You can try to gradually (a few weeks) reduce the intake of carbs instead of completely surprising your body and doing it all at once. But this will give you a slow start and on account of that, you will not feel the benefits so strongly. So our recommendation is that you completely stop with starches and sugar! You will probably lose some weight in a couple of days. Now mind you that the initial weight loss is mostly water weight, it is very important because of the motivational effect it has on people! It helps them to stay on the track! Majority of people that follow a keto diet experience at least some symptoms of the so-called ”keto flu”. It happens a few days after a person starts their keto diet. These symptoms usually go away after just a week, as your body gets accustomed to its new energy source. The primary cause of the keto flu is a high-carb diet that can sometimes cause water retention. Once you begin with your low-carb diet most of this fluid is gone. You will probably go to the bathroom more often, and because of that, you will lose some extra salt too. Because of this, there is a risk of dehydration and salt deficiency. And these two seem the be the cause of the keto flu! You can drastically reduce the chances or completely eliminate the symptoms of the keto flu by drinking enough water and eating enough salt. A simple trick is to take a cup or two cups of broth or bouillon. Keto Diets are Great, But They are not for Everyone! A keto diet can do wonders for diabetics, overweight people and people that just want to better their metabolism. It is not so suitable for athletes or for people that want to bulk up! And just like any other diet, your keto diet will not be successful if you are not disciplined enough to follow through in the long run. After all that, in the nutrition world there are not so many things that are as well researched and proven to work like keto diets are! A keto diet is definitely an effective weight loss diet. It also lowers risk for some diseases. Also, research has shown that keto diets are much superior when compared to regular low-fat diets. Furthermore, keto meals are very filling. So filling that you don’t even have to keep track of your calories to lose food. One study has shown that people who are on a keto diet on average lose weight 2.2 times faster than people that are on a low-fat diet that restricts calorie. Keto diets also improve HDL cholesterol and triglycerides. A different study has shown that people who are on a keto diet lose 3 times as much weight as people who are on a diet that Diabetes UK recommends. There are many reasons why a keto diet is far superior to an average low-fat diet. Some of them include high protein consumption, increased levels of ketones, lower levels of blood sugar, and higher sensitivity to insulin! Weight loss and lower body fat percentage. It can be very helpful for weight loss even if you have a desk job. It can help with cancer prevention. It is suitable for people that have a sedentary life. It resets the body's sensitivity to insulin. A small number of carbs is not always a great thing. You might not get enough sugar and the brain needs it. It could potentially have an adverse effect on the heart. Counting calorie all the time can be annoying. It can be hard to sustain it. The diet has a long history and has been thoroughly researched. Despite that, there are some things we still do not know about it. For example: what are the optimal conditions, some mechanisms we do not fully understand, and how and where it can be applied. But if we are talking about strictly weight loss, it is a very effective diet, but the rules have to be followed strictly or you will not get anywhere!